Canon Fodder's Confession Wagon, an armoured and heavily-armed pope-mobile in which the Canon patrols the streets of future London. Also, the Peacemaker, a heavy-calibre hand-gun dispensing messy oblivion to all sinners. Judgement Day has come and gone, the dead rose from the grave and now everyone who ever lived walks the Earth again. Not surprisingly, over-crowding is rife and crime has escalated out of all proportion. To cope with the chaos (and save space) the Church and the Police Force have combined to form the Priest Patrol. Criminals, are "sinners" to be immediately executed - though they always rise from the grave to re-offend. Cardinal Sin, Deacon Blue, Father O'Blivion - the other members of the Priest Patrol, missing, presumed damned. Canon Fodder discovered the reason God didn't turn up for Judgement Day was that the creator of mankind had been killed by Lucifer. But God got better and finished off the First of the Fallen, once and for all. 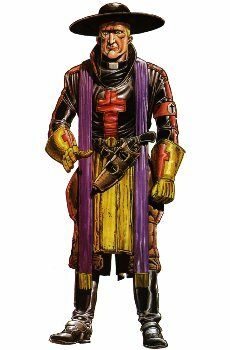 Leaving God to ponder the question who created the Creator of mankind, Canon Fodder returned to New London and went back on patrol, seeking out sinners everywhere.